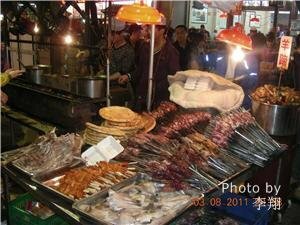 Here is an introduction to 15 best restaurants in Xian along with directions, prices, specialties, or other relevant information. There are several branches of this inexpensive Sichuan restaurant in various places in Xian. They specialize in wonton and tofu dishes. There is a branch in Beilin near major attractions like the Bell Tower and the Beilin Museum. It is four kilometers northeast of the Beilin Museum and 6 kilometers northeast of the Small Wild Goose Pagoda. Another branch is in the Gaoxin district. Since they are less expensive, it is best to call in for a reservation. Beilin location: 8, Youyi East Rd., Beilin District (西安市碑林区友谊东路8号). How to to there: A lot of buses go there including 8, 10, 27, 37 and 43. You can show the above address to a taxi driver. Gaoxin location:No. 6, Guang De Lu, Gaoxin District (西安市高新区雁塔区光德路6号). How to go there: Bus No. 14, 28, 218, 604, and 608 (get off at Ya Mei Da Sha). Price per person: About 40 RMB or about 6.5 USD per person. The specialties of the restaurants: wonton and tofu dishes. This restaurant is fairly inexpensive, but it serves a variety of styles of food and not only Sichuan cuisine. So it is a place to mix and match spicy food with other dishes. It is a large, decorated restaurant. The restaurant is in the Yanta district and close to big attractions. The Small Wild Goose Pagoda is 2 kilometers to the west, and the Big Wild Goose Pagoda is 2 kilometers to the southwest. The Shaanxi Natural History Museum is 3 kilometers or about 2 miles to the southwest. Location: No. 18, Yan Xiang Lu, Yanta District (陕西省西安市雁塔区雁翔路18号). How to get there: Bus No. 31, 33 and 612 go there. It is near where Yan Xiang Road intersects with Qing Long Bei Lu. 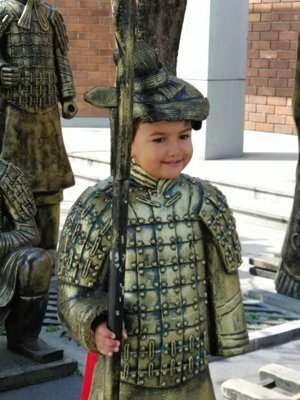 In Chinese: 青龙北路东口. You can show the above address to a taxi driver. Price per person: 50 RMB or about 7.5 USD. This restaurant’s specialty is Sichuan noodles. The price is inexpensive. You can get a small bowl of noodles for 16 RMB or about 2.50 USD and large bowls of noodles for 28 RMB or 4.50 USD. Its highlight is the Tiao Shui Yu cooked at a price of CNY16 per small bowl and CNY28 per big bowl. 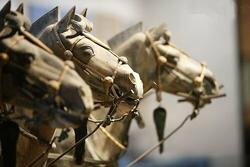 It has a central location nar big attractions in the city of Xian. The Bell Tower and the Small Wild Goose Pagoda are about 3.3 kilometers or a little more than two miles to the northeast. Location: 26, Ke Ji Lu Street, Yanta District (陕西省西安市雁塔区科技路26号). How to get there: A lot of buses such as No. 14, 34, 210, 218, 220, 322, 400 and K400 go there. You can show the above address to a taxi driver. Price per person: 25 RMB or about 3 USD. The specialties of the restaurant: Sichuan noodles and bowls of noodles. This is a big multi-storied restaurant that can seat about 1,000 people, and there is parking on site. It is a little upscale and is geared for formal dinners with friends, and private rooms are reservable. The place is decorated in a traditional Sichuan style. The food has an authentic flavor, and the service is good. 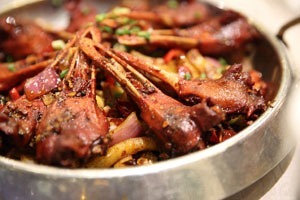 Since the flavor is more authentic, it will be spicier than at other Sicuan restaurants in Xian. It has a central location near big attractions. It is 1.5 kilometers or about a mile north of the Small Wild Goose Pagoda. Location: No. 8, Nan Guang Ji Jie Street, Beilin District (西安市碑林区南广济街8号). How to get there: A lot of buses such as No. 6, 16, 18, 23, 29, and 204 go there. It is about 200 meters or 500 feet north of Zhu Que Gate (朱雀门). You can show the above address to a taxi driver. Price per person: 60 RMB or about 9.50 USD per person. 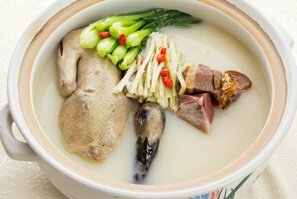 The specialties of the restaurant: Traditional Sichuan cuisine. Fuqi Fei Pian (Beef and Ox Tripe in Chili Sauce) and Duck’s Blood in Chili Sauce (Mao Xue Wang). Reservation phone: 86 298763 3888. This restaurant is a place for both Cantonese and Sichuan cuisine. It is in the Beilin district where a lot of attractions are. The Lao Dong branch is about 5 kilometers southwest of the Bell Tower. Lao Dong Location: 127 You Yi Xi Rd., Beilin District (西安市碑林区友谊西路127). How to get there: Bus No. 10, 24, 29, 40 and several others go there. You can show the above address to the taxi driver or guide. Price per person: starting at 50 RMB or about 7.5 USD. The specialties of the restaurant: less spicy Sichuan and Cantonese cuisine. The Da Wan Cheng Restaurant is near the Terracotta Warriors and the Huaqing Hot Springs. A lot of other attractions are in the area. It is about 2 kilometers southwest of the Qinling Palace. 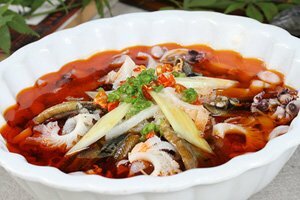 The specialties are Hunan and Sichuan cuisine. There are lots of kinds of noodle dishes. The restaurant is in the Da Wang Cheng Hotel. Location: Dongguan Street, Lintong, Xian (临潼区东关街). How to get there: Bus No. 5, 307, 914 and 915. You can ask your driver or guide to call the reservation number. The specialties of the restaurant: Sichuan and Xian noodles. This Sichuan restaurant is adapted for the people in Xian, so the food is less spicy and Westerners might like the taste more. There are several others with the same name in the city. This branch is near big attractions. It is about 1 kilometer east of the Beilin Museum and about 2 kilometers or about 1.2 miles southeast of the Bell Tower. Location: 2, Fengdeng Rd., Beilin District (西安市碑林区丰登南路2号). How to get there: A lot of buses such as No. 5, 25, 27, 30, 41, 221, and 410. You can show the above address to a taxi driver. Price per person: 60 RMB or about 9 USD per person. 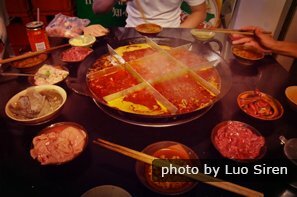 The specialties of the restaurant: less spicy Sichuan food. Nuo Mi Pai Gu (ribs with rice), Fuqi Fei Pian, and Tang Cu Xiao Pai (sweet and sour ribs). It is near the Big Wild Goose Pagoda. The restaurant is famous for its seafood. It is an old restaurant. It is popular with locals and is nicely decorated. It is only about a kilometer or .4 miles north of the Big Wild Goose Pagoda. How to get there: Buses that go on Beidajie Street such as Bus No. 6, 10, 36 and Tourist Bus No. 4 go there. Price per person: 100 RMB or about 15 USD. The specialties of the restaurant: seafood and snacks. The restaurant is reasonably priced so reservations are needed for dinner time. The restaurant seats about 200 people. It is near the Hanguang Gate of Xian. The restaurant is popular for the Ye Cha (night tea snacks) dishes such as dim sum that are served after 8:30 pm. Entertainment is provided. 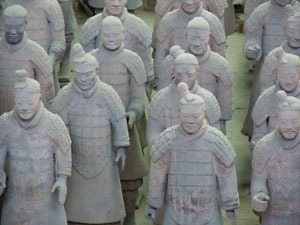 It has a central location south of the Xian Train Station and is near most of the big attractions in the city of Xian. The Xian Bell Tower and the Small Wild Goose Pagoda are both less than 2 kilometers away. Hours: 10:30 to 2:30 and 5:30 – after midnight. How to get there: Bus No. 6, 16, and many others go there. You can show the above address to a taxi driver. Price per person: 20-100 RMB or about 3 to 15 USD. The specialties of the restaurant: Ye Cha snacks, seafood, refreshments, entertainment. This is a place to go for seafood and wine and beer. It is an upscale restaurant, and some of the dishes like Shark Fin are expensive. 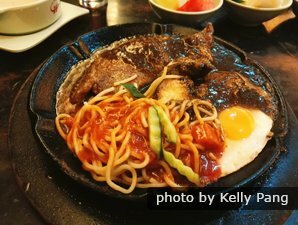 There is a main restaurant at the Gaoxin district and a branch restaurant in the Beilin area where many attractions are. How to get there: Bus No. 29, 104, 102 and many others go there. You can show the above address to a taxi driver. The main train station is near the Beilin district. Price per person: 90 RMB or about 13 USD. The specialties of the restaurants: Ye Cha snacks after 8:30 pm, seafood, alcoholic drinks. This is a place to go in central Xian for Cantonese food. It is near the Bell Tower. It is an upscale restaurant in a hotel. It is a big restaurant, and they can accommodate 800 people in various rooms. There is a buffet, and the restaurant features seafood. How to get there: Bus No. 501, 706, and 707 go there. You can show the above address to a taxi driver. Price per person: 50-200 RMB or about 8 to 30 USD. The specialties of the restaurants: Seafood and buffet. This big restaurant is west of the Beilin District where many Xian attractions are. 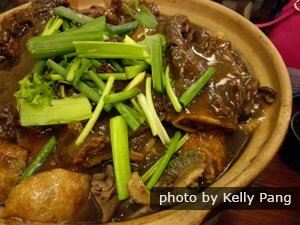 Unlike most of the other Cantonese restaurants on this page, it is not in walking distance to major attractions. It is about 5 kilometers or three miles from the Big Wild Goose Pagoda. There is a big parking lot in front of it, and it is multi-storied. How to get there: A lot of buses go there including Bus No. 35, 207, 211, and 212. You can show the above address to a taxi driver. The specialties of the restaurant: The Ye Cha (night snacks) are featured from 8:30 pm to about 2 am. Location: 22 Nan Er Huan Dong Duan, Yanta District (陕西省西安市雁塔区二环南路 (东段）22号). How to get there: Bus No. 242, 308, and 716 go there. You can show the above address to a taxi driver. Price per person: about 150 RMB or about 22 USD. With a rich Mediterranean expression and decorated with colorful roofs, wooden balustrades, brick walls and red doors, this restaurant shows customers its good intentions and great ideas. It is a great place for both couples on a romantic date and friends getting together for a night out. The cuisine is at once attractive and tempting. The seafood pizzas and pastas are authentic and delicious and have earned a high regard from customers. The different soup choices are also popular. How to get there: Take bus 14, 210, 211, 308, 312, 604 or 608 and get off at Gaoxin Road (高新路站). Open: 11:30 a.m. - 2:30 p.m.; 6:00 p.m. - 10:30 p.m. 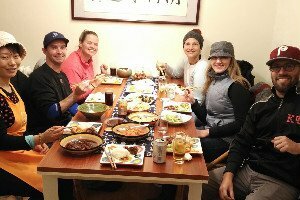 The food is spoken highly of by customers and is of a good appearance and high quality. The desserts, especially the hot chocolate cakes, are popular choices. How to get there: Take bus 502, 702 or 707 and get off at Beiyuanmen (北院门站). Open: 11:30 a.m. - 3:00 p.m.; 5:30 p.m. - 10:00 p.m.
Our clients are enjoying their meal in one of our well-selected restaurants. 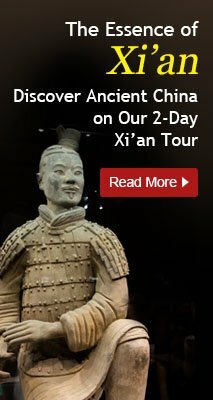 Visit our Xi&apos;an Tours page to see more tour ideas.